Edward O. Thorpe wrote a book titled "Beat the Dealer" in 1962. He utilized software and computer programming to discover that there were, indeed, cards that were beneficial to the player while others helped the dealer. This basic strategy gradually grew into the card counting technique we know today. By calculating which cards are beneficial to the player and where they are in the deck, a person is able to even the odds. Card counting is basically performed by simple mathematical calculations. If done correctly, it can drastically change the odds for the player, giving them a higher success rate. Basically, higher value cards are beneficial to the player while lower values are not. The reason for this is because the dealer will get another opportunity to take a hit with low value cards. What must be understood is that dealers have a set of rules they must follow. For example, most casinos require their dealer take a hit until they reach seventeen. By eliminating the odds, players are able to guess what the dealer has, and plan accordingly. While it may sound complicated, counting cards is just that, counting. 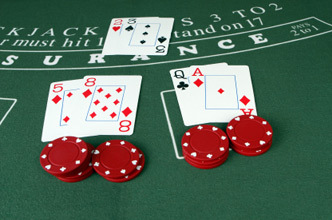 By doing this one simple task, a player may be able to alter their odds by two or three percent. Although counting cards is not a guarantee by any means, you can win about 44 of every 100 hands you are given. While it may not seem like a lot, this is much higher than playing without any strategy. Counting cards is not illegal (if you don't use a device), but that doesn't mean you won't run into resistance. Since casinos are owned on private property, they are able to kick you out for any reason. If you try to get back in, you can even be arrested for trespassing. There are some casinos on Atlantic City that actually allow counting cards, but they have gone to extreme measures to make sure the strategy is not effective. This is done by adding multiple decks and having lower deck penetration. Some players worry about being "back roomed" by the casino. This is a technique that was used back in the day when the manager would bring you to the back room to talk to you. This talk may include a threat or accusation, back in the day, there was even some physical contact. This image has a lot of gamblers worried. However, it is not legal for a casino to detain a person unless the person has committed a crime and they are waiting for the proper authorities to arrive. In other words, if you have committed a crime, you may be detained, but not for counting cards.